Chiyokichi Natsuhara was the self-appointed caretaker of the Auburn Pioneer cemetery for most of his adult life. He was so dedicated to maintaining the cemetery that, even while he and his family were interned in Idaho during World War II, he continued to take up collections from his fellow inmates for the care and upkeep of the Japanese burials back home. When the Natsuhara family eventually returned to Auburn after the war ended, they found the cemetery vandalized and so choked with weeds and tall grass that they had to use scythes to cut the vegetation back to manageable levels. "Back in May, 1906, when we lost our one-month-old daughter, we held a funeral for her with a few of our friends, with Rev. Gendo Nakai officiating. He was the first missionary to the Seattle Buddhist Church. At that occasion I remember finding another tombstone of a Japanese named Suketa Kumano who had been killed in 1903 by a railroad accident at Kent. Had he been a railroad worker? What town in Japan had he come from? I don't remember a thing now. But at any rate, there were only the two [Japanese] tombs at the time of my daughter's funeral." M. M. Tumara was run over and killed by a Northern Pacific passenger train on the White River bridge south of Kent Saturday afternoon. He was instantly killed. Tumara tried to get out of the way of the approaching train but was caught before he could make his escape. He had a narrow escape from being killed in a dynamite explosion at Christopher last Monday. The house in which he and a number of other Japanese were lodging was blown up by a powerful explosion. One was seriously injured. On Monday of this week a Jap by the name of T. Mitsonakee, and a companion with an unpronounceable name, engaged in clearing some land near Christopher, put several sticks of dynamite in an oven to thaw it out. Result: Terrific explosion; cabin torn into pieces, two Japs hurled into the air. One of them was injured so badly that he had to be taken to the hospital in Seattle. 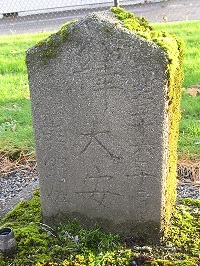 So, indeed there was a Japanese man (residing in Christopher/Auburn) who died in a railroad accident in Kent in 1903. The fact that his name is recorded in the newspaper differently (or in the case of the latter article not at all-since it was deemed "unpronounceable"), is yet another reflection of the white community's attitude that their Japanese neighbors mattered little—so little that it didn't even matter that their names were recorded accurately in their published death notices. While we are confident that the two above referenced articles refer to the same unfortunate Japanese man that Mr. Natsuhara referred to, we can't help but notice that Mr. Natsuhara's questions remain unanswered despite the newspaper coverage: Had Kumano worked for the railroad? What town in Japan had he come from? At this late date, unfortunately, we may never know the answers to these questions. * Ito, Kazuo. Issei: A History of Japanese Immigrants in North America, trans. Shinichirio Nakamura and Jean S. Gerard. Seattle: Japanese Community Service, 1973. ** The cemetery's original plat map indicates a burial for baby Hikane Ito who died on July 24, 1890. Since the early Japanese graves were neither well recorded nor marked, it is possible there were other earlier burials that went unnoticed by Mr. Natsuhara at that early date.